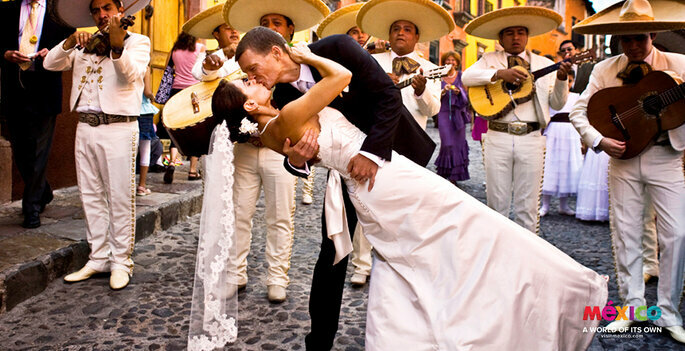 Completely separate from the rest of the planet, Mexico is a magical destination that is perfect for your honeymoon - full of magic and splendor, you're sure to fall in love all over again! Mexico is undeniably magical, with unique colors, flavors, peoples and traditions. 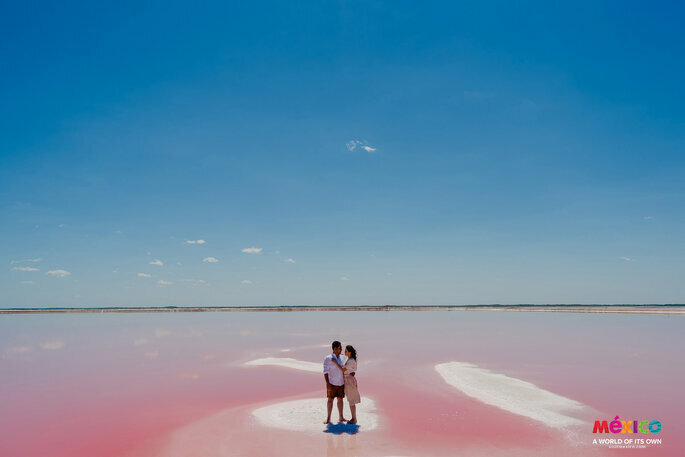 With its stunning backdrops, fascinating cultures, and never-ending parties, it is also the perfect destination for your honeymoon – and is guaranteed to give you an experience that you would not be able to find within the states. This country is full of contrasts, and await your arrival and exploration – there are hidden treasures in the most unexpected of places, allowing you to integrate with nature and its people. Venture deep, and you’ll be able to uncover a singular way of life, and fall in love all over again in one of the most beautiful countries in the world. Mexico awaits, and what are you waiting for? To help you make up your mind, today we are going to talk about some of the best places to go that will inspire you, and will help you discover some of the hidden gems of the country where you can make unforgettable memories with your loved one. Accompany us on our journey across this country, and find the perfect place for your honeymoon that you had never even dared to dream of. We start with Acapulco, in the state of Guerrero. This is the best destination for beach lovers – here you will find a paradise, which has been recognised globally for its crystal-clear seas, golden sand, and tropical climate. The perfect eternal summer… Not just this, here there is a perfect combination of beautiful landscapes and lovely people. You can also enjoy many eco-tourism activities, which are very popular here. You can navigate offshore, and discover just why Acapulco is one of the most desired tourist destinations. With the rhythm of the waves of the sea, see why divers choose it as a once-in-a-lifetime opportunity and experience, thanks to “La Quebrada” – a place where you can watch them perform spectacular dives, the likes of which are not seen anywhere else in the world. You can also see in the flesh, alongside your partner, the “Feathered Snake”, Diego Rivera’s infamous mural painting. Acapulco is a place that will enchant you from the start, and invite you to discover its most incredible treasures. We leave Guerrero to go to one of the most desired destinations for tourists internationally – and it’s not for nothing! The magical and impressive state of Quinata Roo gives us some of the most acclaimed landscapes in all the world, with perfect places to enjoy the sun, the coral reefs, and the best parts of the Caribbean Coast. There is no end of ecotourist activities to participate in, with one of the most famous being the subaquatic museum. These destinations are ideal for adventurous couples, who aside from relaxing on the beach want to explore nature, and discover tropical species, sharks, and many more. Experiences like swimming in the purest waters, and visiting spectacular shows such as Joya, from the Cirque du Soleil, are all possible here in Mexico. There are wonderful beaches, which offer a lot of privacy, such as Akumal, Puerto Aventura and Playa Maroma – so don’t miss out, and have a look at Quinata Roo for your incredible honeymoon! Cancún and Riviera Maya. Photo: Alan Fresnel. Colours, traditions, and a destination that cannot be ignored by any tourist; Chiapas, found in the south-west of Mexico, unites 7 different ecosystems – as such, this site has become one of the best places for couples looking for a trip that is steeped in history and nature, and is full of places the likes of which you could not even imagine. You will be able to travel through unbelievable archaeological zones such as Palenque, as well as having the option to listen to traditional marimba music in the streets. Don’t doubt it – here you will be able to visit natural hotspots, mangroves, waterfalls, jungles and breath-taking forests. A rich mix of Mayan culture and ethnic diversity means that Chiapas is the perfect place to get to know the profound history of Mexico, understand its roots, and immerse yourself in the magic of its peoples and customs. Chiapas. Photo: Juan Carlos Montoya. We return to Guerrero, because we cannot leave without telling you all about the magic of Ixtapa Zihuatanejo, located on the coast of Mexico. One of its principal attractions comes from the opportunity to enjoy its tranquil waters in the bay. Also, there is a great variety in locations available – from mountainous regions to magnificent seas which you find difficult to forget. A quiet destination, made for nature lovers who are enamoured not only with each other, but with the idea of disconnecting from the humdrum of daily life, and getting lost within a natural paradise which offers an enviable assortment of activities to enjoy from start to finish. It always has been and always will be one of the preferred destinations for couples and around-the-world travellers. The state of Baja California contains one of the wonders of the world, with spectacular beaches, surrounded by the best quality sand where the Gulf of California and the Pacific Ocean meet. 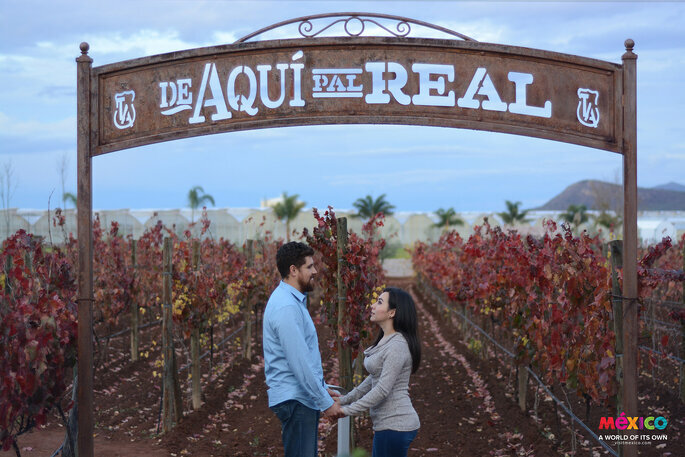 You will be able to choose between the magic of Cabo San Lucas or San José del Cabo, the two destinations known collectively as Los Cabos, which are most excellent for your honeymoon – and one of the most desired destinations to celebrate your wedding as well. 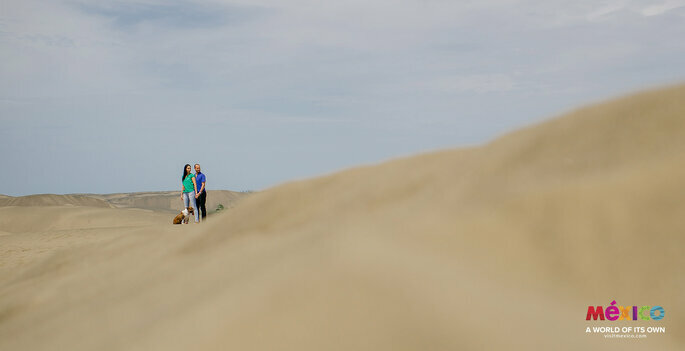 A romantic and magical destination, in Los Cabos you will find an infinite number of admirable landscapes thanks to its dynamic mix of deserts, mountainous regions and beaches. And amongst all of these areas, there are luxurious resorts around every corner – this place awaits your arrival with anticipation! Los Cabos. Photo: Josafat de la Toba. 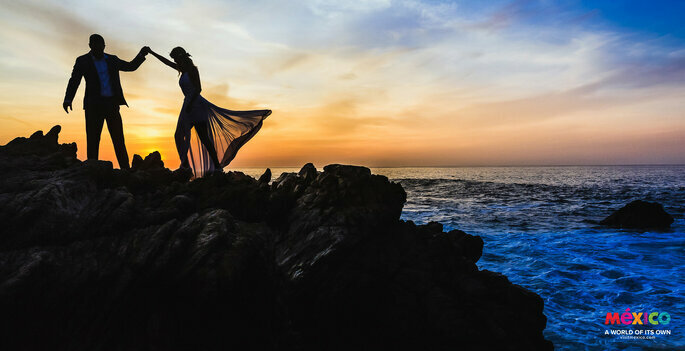 Recently discovered as an incredible destination for tourists, Riviera Nayarit is one of the best places for couples who want to experience the true essence of Mexico on their visit. Surrounded by the Pacific Ocean and the Sierra Madre Occidental mountain range, magic is everywhere that you look, and the coastal islands bring an unique touch of beauty to this incredible corner of Mexico. Here you will find locations for couples of all likes and styles. From luxurious hotel complexes to deserted beaches for those who like adventure and want a place to surf and relax, there is something for everyone. Beautiful mangroves, clear water lakes, flamingos (! ), and picturesque towns are just some of the features on offer for those who dare to venture this far. Alongside the friendliness of its inhabitants and its excellent food, Riviera Nayarit is completely unique from the rest of Mexico – check it out now! We now travel to the state of Guanajuato, to immerse ourselves in the Mexican shoals offficially categorised as a World Heritage Site by UNESCO in 2008. This is a place that you have to visit – and even more so when you consider yourself to be a lover of the arts, as this is a city with a cosmpolitan ambience, with unique architecture and hidden corners that only the most curious souls can uncover. You will fall in love with every place, from La Parroquia San Miguel Arcángel to the Mercado de Artesanías, to the archaeological zone of La Cañada de La Virgen. A place defined by history, love and fantasy, San Miguel de Allende has a mix of all of these elements, and has become a place that you have to see at least once in your life. Because of this, we at Zankyou say that it is an essential destination for your honeymoon – whether you choose to stay, or just pass through. Here, adventure waits around every corner, and you will fall in love a hundred times over. Veracruz is so full of things to discover that it would be impossible for us to list all of them to you. A place with the most incredible festival atmosphere in all of Mexico, alongside the most significant commercial maritime port in the Mexican Republic, you will be able to better discover the heart of Mexico here. There are also many exciting activities to get up to – including exploring Veracruz’s infamous rapids! You will be able to take a tour of San Juan de Ulúa, a fortress located on its own island, where the ancient ancestral ruins of Cempoala and La Antigua meet. You will be immersed in a world full of hidden spaces, high-quality gastronomy and pure magic – every backcorner and alley of Veracruz has its own history and adventure just waiting for you to arrive. If you and your partner are looking for a traditional destination, but with the most unique quirks and features, then there is no better option. Verazcruz. Photo: Eduardo Efraín Pavón Munguia. This state is found in the south-east of Mexico, and is unique due to its fusion of three cultures: Mayan, Spanish and Lebenese. This can be seen at every turn – in its architecture, its food and its peoples. Here you will find a destination where the avant-garde movement meets tradition, resulting in a magical setting that awaits you with open arms, with the hope that you will have a memorable experience exploring its streets, trying its unique dishes, and mixing with the locals who will also do their best to make your trip incredible. Don’t miss out on experiencing the best of Mexico, in a place that will always remain in your heart. We end our list of recommendations with Zacatecas. In the central-Northern region of the country, this place has many different colonial communities with international recognition, such as Guadalupe, Sombrerete, Jerez de Daría Salinas, Fresnillo and without doubt, Zacatecas – the capital of the state. This place was originally a mining town, thanks to its foundations overlying a great amount of silver. You will be able to enjoy a train-ride that will bring you to the Mines of Eden, and then discover the inspiring stories behind the people that built this city. Alongside this, there is impossibly impressive architecture to be enjoyed, and unforgettable sights that will stay in your memory and heart forever. There is no doubt in our minds that Mexico is an incredible place to visit on your honeymoon, and in your future together. There are so many possibilities – and we’re sure that once you’ve visited once, you won’t be able to resist coming back again and again!